Partez à la découverte du riche patrimoine de la Lituanie lors de cette visite de 4 heures en petit groupe au parc commémoratif de Paneriai et au château de Trakai au départ de Vilnius. Visitez le parc commémoratif de Paneriai avec un guide et découvrez l'histoire de la Seconde Guerre mondiale en Lituanie. 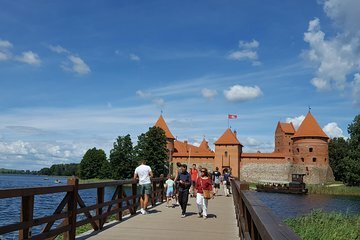 Profitez des vues panoramiques sur la campagne pendant le trajet vers Trakai, qui abrite l'imposant château de l'île de Trakai. Profitez d'une visite guidée du château et découvrez son rôle en tant que centre militaire et politique de la Lituanie. Admirez les trésors anciens de l'histoire colorée du pays dans le musée et profitez du temps libre pour explorer les environs avant de retourner à Vilnius. This tour was amazing!.Supposed to be a small group, but turned out it was only me. Inga, my tour guide was really wonderful and explained lots of stuff that I did not know. She explained the Jewish heritage in Vilnius then at the Paneriai Memorial Park. She answered my questions and we had good conversation about Lithuania's history afterward. Trakai Castle is really beautiful place surrounding by frozen lake and Inga amazingly explained the history of the castle. I highly recommend this tour to anyone that visit Vilnius!!! Great tour with a very knowledgeable guide! A little pricey, but very good! was well explained. The trip to Trakai was the highlight with a full tour of the castle and an explanation of each room. The final stop was tasting some of the most amazing Kibinai. Very great experience. The tour it's very interesting with special guide who shaw and explain us history and experience..We encorage people use this tour also in winter. the wiews and environment are special and beautiful. Thanks to offer this possibility. We enjoy a lot. This trip to Paneriai and Trakai Castle was great. As advertised small- group, there were only four of us, which was great and allowed us to take our time. The tour was full of history and our guide was very knowledgeable. As we walked around Paneriai she gave us such details that allowed you to imagine the pain and horror that took place in such a beautiful park. Trakai Castle was beautiful as well. Our guide described things in the museum that I probably would have missed if by myself. We were also given time to try the local pastries which were very yummy and I recommend them. I would recommend this tour to my friends for sure...it is a good way to explore more than Vilnius on your Lithuanian get away. Andreas promptly picked us up at 10:00 in the van. He gave us a brief overview of the Jewish history in Vilna and pointed out some landmarks so we would have context for the Jewish Memorial. Andreas explained everything at the memorial and answered my many questions along the way. I appreciated how knowledgeable he was about the topic and how he addressed all my points. Also, he has a great voice. Andreas should be narrating books. He's great to listen to. We loaded back onto the van and made out way to the castle. It was beautiful and I liked Andreas's narration of Lithuanian history. He kept the castle tour concise so we would have enough time about an hour to wander through the craft stalls and grab a quick bite to eat. Andreas dropped us back at 15:00. It was a wonderful day and very worthwhile trip. Excellent tour. Inga was a great guide. Her English was good and she knew her subject. She was able to give us lots of information and to answer numerous questions. She was flexible with the timing and did not rush us through the Castle. A tour I would recommend.